It's time for another Friday Challenge with Your Next Stamp. 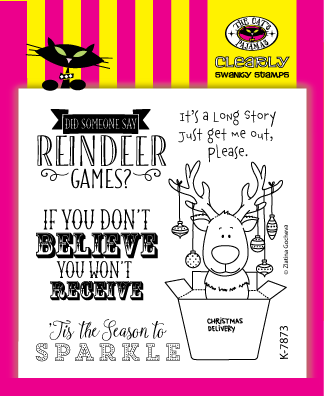 I decided to use the sketch (as I seem to always do) along with the newly released stamp set of Tweet Holiday. This is such a funny set with that bird with the hat over his eyes. Always makes me giggle! I used my Copic Airbrushing system to create the background. Just an abstract shape I made, but sort of wished it wasn't so "perfect." It really should have had a rougher edge, but that's ok. I still like how it turned out. For the sky, I also used the airbrush to lightly brush the sky and then used a darker color with the brush end to create a splatter effect. The image was stamped and cut out using the coordinating die and colored in with Copics. It was then popped up over the glow of yellow once the back panel was made using some of the Holiday Joy paper collection. The sentiment was placed at the top while the card was finished with some stars from the Cool Die Three set to mimic the patterned paper. Some Silver Tinsel gumdrops completed the look. Don't forget to stop by the YNS Blog to see the other fun creations the DT have done. They are sure to get your creative mojo. Thanks for stopping in and hope you have a great weekend! It's time for the October Feature Day with Your Next Stamp! This month the DT was challenged to create something around the theme Magical. The team did not disappoint and made some super fun projects. I decided to make a card using the cute set of Sports Fanantics - Shoeper Awesome. I thought it was perfect to use this image with the sentiment to create a magical get well card. I stamped and colored the image with Copics before cutting it out with the coordinating dies. I used the Starburst Background set to stamp behind the shoe for some glow. The shoe was popped up over that. I used the YNS Hugs and Kisses paper collection for the back panel and cut out the fun scalloped panel using the Stitched Scallop Rectangles die set. The card was finished stamping the sentiment directly onto the top panel and adding some Candy Land glittered gumdrops and popping a couple of stars from the same patterned paper. Thanks for stopping in and don't forget to stop by the YNS Blog to leave a little love! You can have a chance at winning a stamp set of your choice! Woot! Have a great rest of the weekend. It's time to shop!! 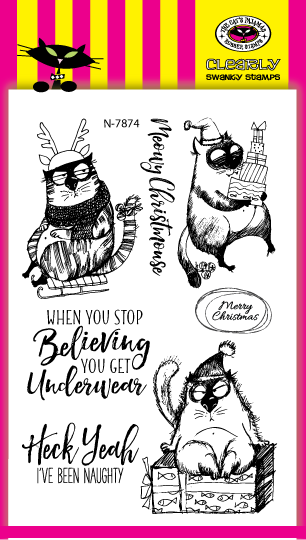 The Cat's Pajamas Stamps new release is here for you to grab all your favorites you spotted during the sneaky peeks. If you have arrived here from the fabulous Brenda's blog, then you are in the right place. If not, be sure to start there to begin the hop. For my card, I am using the super cute set of We 3 Snowmen. They are too cute! I made my card a 3/4 cut card so that the 'SNOW' shows at the bottom of the card. I colored in the thin lines of 'snow' with a light blue/green waterbased marker and the main images were colored in with Copics. I layered the top panel over some glittered cardstock and finished the card with some rhinestones. Are you in it to win it? Be sure to leave a little love as you hop along and you can have a chance to win a $10 gift certificate to the TCP Store! The time has come!! It's Sneaky Peek Week with The Cat's Pajamas Stamps and I am bringing up the rear to end the week of fabulous peeks the Cat Pack has done. If you have missed any or all of the peeks, you will want to be sure to scroll through the TCP Blog. You will not be disappointed in all the inspiration you will find. For my first peek, I am using the absolutely awesome set of Fat Cat Christmas. This set has some of the best sentiments perfect for the cheeky gift giving this season. The image was stamped and colored in with Copics before being cut out using a stitched circle die and popped up over the patterned paper. The presents were cut out using the new Presents Cut-Ups to be popped up over the image and the sentiment popped up at the top. This second peek is a tag made from the new Rudolph Cut Up paired with the Presents Cut Ups and the sentiment from the Reindeer Games stamp set. My intent was to have the reindeer seem as though it was popping up over the present and added some fun by using some googly eyes I have had in my stash for quite some time. I also couldn't resist adding a little bow to her head as well. Are you in it to win it? A random winner will be picked to win a $10 TCP Gift Certificate to the TCP Store for leaving a comment either on the blogs or the Cat Pack's Instagram page. Leave a little love for your chance to win!! Don't forget to stop back tomorrow for the new release blog hop!! There will be more awesome inspiration to wet your creative palette. Thanks for stopping by! It's time for another Friday challenge with Your Next Stamp. The sketch is so much fun and I couldn't resist using it for this card. I used Warm Christmas Wishes along with the new Holiday Joy paper collection for the main focus of the card. The image was stamped and colored in with Copics and then cut out. For the circle background, I used two pieces cut using the YNS Circle dies and Stitching Mark dies. I then took one of the circles to be cut out using the Evergreen border die so that it can be popped up over the second circle to create a little scene. I stamped the "steam" before placing the mug where I wanted it using some foam tape. I thought otherwise to color in the star, but now I am wondering if I should have. Oh well, I still like it plain. : ) The patterned paper was layered over some red cardstock and the sentiment was stamped and fishtailed to be placed at the bottom. The card was finished with a little Stickles to the tops of the trees for added sparkle. Don't forget to stop by the YNS blog to see the other fab creations the DT have done. Thanks so much for stopping in and taking a peek! This month's DT Dare with YNS is all about being Merry! And as usual, the team did not disappoint. SO many fun holiday ideas and beautiful projects. For my card, I really can't get enough of the new stamp set of Jingle Bells and the new Pine Tree Branch die. Such a great combination. I used the YNS Snowfall Panel background die layered over some silver cardstock. The pine branch was cut out using some dark green scrap cardstock, layered and the bow added to the top. The sentiment was stamped and heat embossed with silver powder over the silver cardstock. I then cut out the sentiment with the coordinating die and popped over the branches and panel. It was completed with some new fun gumdrops. Don't forget to check out all the fabulous creations on the YNS Blog and leave a little love. You can have a chance at winning a stamp set of your choice! Thanks for stopping by and taking a peek. Hope you have a great Wednesday! Weren't all the sneaky peeks fabulous? The YNS DT did a wonderful job showcasing all the new releases. Now it is time to hop and shop! 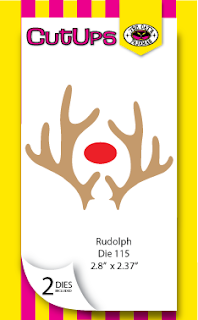 For my first hop card, I am using the new set of Tweet Holiday. I love this image. It totally makes me laugh because we all have that one family member like the bird under the hat. hahaha! I was inspired by Jennifer McGuire's post on partial die cutting that I wanted to create on using the YNS Evergreen border die and the new stamp set. The image was stamped and colored in with Copics and cut out using the coordinating die. Once I created the partial die cut background, I layered the sky area using some patterned paper using the new YNS paper collection of Holiday Joy. The image was then popped up in the front while the sentiment was stamped across the top and at the bottom. I finished the card with some new yummy gumdrops and some rhinestones. For my second card, I am using the new set of Merry Mouse Eve to create this quiet scene of the season. I created the background using different Memento Inks and sponging them together. Although, IRL it does blend better than the picture shows. Before I stamped the image, I used the coordinating die to cut out a piece of a Post It note and placed it where I wanted to have the image. From there I sponged in the color. Once the background was done, I peeled off the note and stamped the image directly onto the cardstock. The image was colored in with Copics while the snow from the image was stamped over in different spots so it looks to be snowing through the whole sky. I used my white gel pen to highlight the snow in the center. The sentiment was stamped across the sky and the panel layered over a piece of patterned paper from the new YNS Holiday Joy collection. A few Silver Tinsel gumdrops were placed through the sky for a little sparkle. Karen has a generous sale for you to purchase all your favorites this release by offering 20% off your entire order! You can't pass a savings like that up. 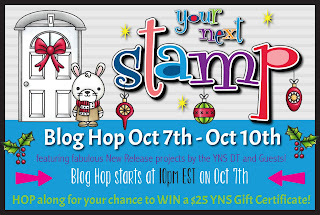 Thanks for hopping over and don't forget to leave a comment as you hop along so that you will have a chance at winning a YNS gift certificate! Today is sneaky peek day for the October release for Your Next Stamp! Yippee! There is so much stampy eye candy that you will have a long list for this release to get your holiday projects a jump start! For my card, I used the new Pine Tree Branch die and the stamp set of Jingle Bells. I love how this card turned and it can be made fairly quickly for multiple cards. I cut the pine branches with two different colored green cardstock and used some glue dots to adhere them together. The bells and bow were stamped and colored in with Copics before being cut out with the coordinating dies to be popped up over the branches. The background panels are made from the new YNS Holiday Joy collection while the front panel is embossed using the branch embossing folder from Cuttlebug. The sentiment is stamped also cut with the coordinating die and popped up. Simple and perfect for the holidays. 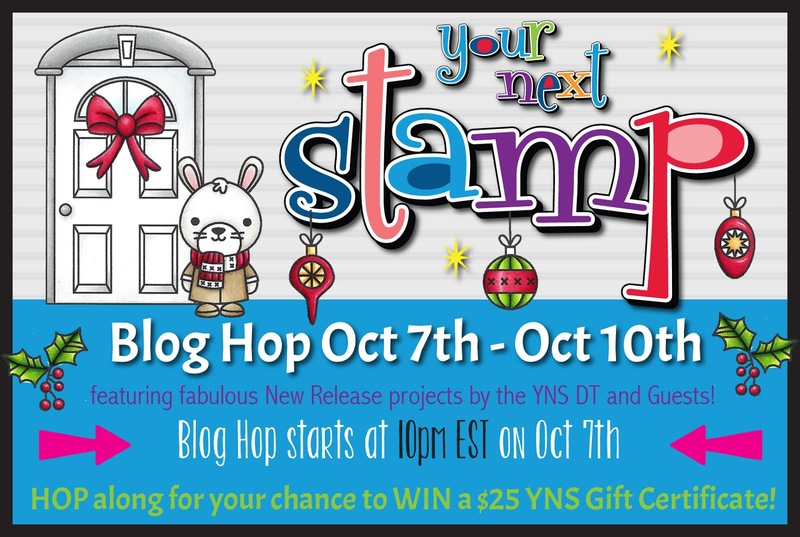 Don't forget to stop by the YNS Blog to see all the fabulous creations the team have put together and come back tonight for the new release blog hop! Thanks for stopping by and have a great Saturday! Today is a new TCPTUES challenge and the theme is Sparkle! Who doesn't love a little sparkle on their projects? I decided to mix in a few different technique to make my card sparkle and I really like how it turned out. I started with some patterned paper from Pink Paislee for the back panel and used TCP's 3x3 Stars Cutups for the shaker and the other stars. I started by heat embossing a piece of white cardstock using some silver tinsel embossing powder. I then cut out the stars from that and started working on the shaker star. In order to cover the cut up completely so that the glitter and sequins didn't fall out, I used my Spellbinder star dies to find the right size to cover the cutup. Once the shaker was complete, I placed it where I wanted it and proceeded to place the other stars throughout the front using some foam tape for dimension. The sentiment 'Joy' was cut out using TCP's Joy Cut up in black cardstock and adhered at an angle. I finished the card by adding a few grey and clear rhinestones. We sure hope you play along and enter your creations to the linky! You can have a chance at winning a $10 TCP gift certificate! Thanks for stopping by and hope you have a great week! !